WindeX Closable Grids serve a double purpose. You get an attractive stainless steel grid and the ventilation opening is easy to use and seals with a single movement. Various classification societies accept the WindeX Closable Grids as fire damper. They can also be used on seagoing vessels. The WindeX Closable Grids are made entirely from RVS 304 (stainless steel 304). The WindeX Closable Grids can also be made entirely from RVS 316 (stainless steel 316) on request. They are resistant to seawater and are guaranteed for an extremely long working lifespan. WindeX manufactures all Closable Grids entirely by itself. This means we can offer short delivery times and an extensive product range. WindeX can manufacture a stainless steel grid – made to measure – for almost any ventilation opening. You can easily install WindeX Closable Grids yourself. You can also call on WindeX’s own team of installers who will place the grids quickly and professionally for you. Windex also offers special constructions such as remote operation through a servomotor and/or cable. Deviations from the standard flange dimensions and installation depth are possible. Call +31 (0) 184 61 13 22 for a competitive price for your stainless steel Closable Grids. Tailor-made for your application. 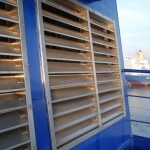 In addition to its closable grids, WindeX Engineering also offers complete ventilation systems. A combination order offers more benefits.